Posted April 28, 2015 by Tony Muka & filed under 2015 NACUSO Annual Conference Highlights. ORLANDO—IdentityX, the provider of a mobile biometric authentication platform, won NACUSO’s Next Big Idea competition during the association’s annual meeting here. 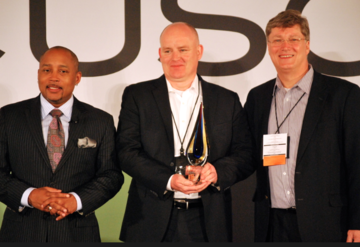 From left, Shark Tank’s Daymond John with Conor White and Mike Groat of IdentityX, which won NACUSO’s Next Big Idea competition. The Fairfax, Va.-based company was selected by audience vote after it and four other companies made presentations and took questions from judges, who included Daymond John of ABC’s Shark Tank. The solution uses a video of the user’s face and voice over a mobile device to authenticate the user. No password or user name is required. It is currently used by more than 180,000 USAA members to access their accounts. Daon also won the Best of Show award from the CUNA Technology Council earlier this year at CUNA’s GAC. Other companies competing in the Next Big Idea competition included gameFI, Isthmian CUSO, Obloco, and OnApproach.